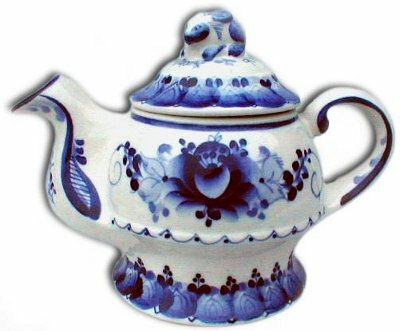 The Russians word for a teakettle is чайник; it comes from the word чай (tea). The teakettle is used to heat up water for the tea, while the заварной чайник (teapot) refers to the vessel in which the actual tea is served. Today, many households also have the электрический чайник (electric teakettle). Russians commonly say чайник when talking about either one of the three, but fortunately that rarely causes confusion. Слышишь? Чайник уже закипает, иди скорей на кухню и убери его с плиты. You hear that? The teakettle is beginning to boil, hurry to the kitchen and remove it from the stove. Мне подарили очень дорогой фарфоровый чайник, который я теперь использую только для лучших сортов японского и цейлонского чая. As a present, I received a very expensive porcelain teapot which I now only use for the best Japanese and Ceylon teas. Георгий случайно уронил поднос с завтраком, и полный, горячий чайник разбился вдребезги. George accidentally dropped the breakfast tray and a full, hot teapot broke into tiny pieces. Нам надо купить новый чайник, потому что этот уже заржавел. We need to buy a new teakettle because this one has gotten too rusty. Какой же ты чайник, ни одну математиматическую задачу на экзамене не решил. What an airhead you are. You didn’t even solve one math problem on the exam. The word тарелка is translated as plate. For the most part, it is a kitchen term, but can also be used to describe a UFO saucer (летающая тарелка), a satellite dish (спутниковая тарелка), or the percussion instrument cymbal. Папа разбил три тарелки, пока готовил обед. Dad broke three plates while cooking dinner. Фарфоровая тарелка ручной работы может дорого стоить в их магазине. A hand made porcelain plate can cost a lot of money at their store. Барабанщик, как же ты будешь сегодня играть без тарелок? Иди скорей и попроси их у кого-нибудь занять на пару песен. Drummer, how are you going to play without the cymbals? Hurry up and ask someone to let you borrow them for a couple of songs. Oдин раз кто-то мне просто так вылил на голову тарелку борща. 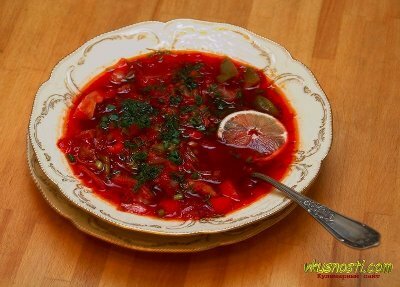 One time someone poured a plate of borsch on my head for no apparent reason. Here's a short, connected dialog that shows you not only the word тарелка, but also has some good vocabulary you'll encounter generally while shoppping. — Hу, например пятьсот двадцать за каждую. Тарелки из Санкт-Петербурга, так что дешевле вы нигде не найдёте. “Well, for example five hundred and twenty per each. The plates are from St. Petersburg so you won’t find them cheaper anywhere else. The Russian word for spoon is ложка. If someone were using the word spoon in plural terms (spoons), they would say «ложки». When I eat dessert, I say “I need a spoon” «мне нужна ложка» and if I am serving dessert to a group of people, I would say, “I need spoons” «мне нужны ложки». Just like in America, Russia has a different word for teaspoon and tablespoon. The word for teaspoon is чайная ложка which comes from the word чай (meaning tea) while the word for tablespoon is стoловая ложка which comes from the word стол (meaning table). Traditionally, Russian people use wooden spoons «деревянные ложки» to eat and play music with. Two wooden spoons were held in one hand back-to-back and the player would tap the spoons against each other thus, making a sound. Russian wooden spoons are elaborately painted with bright colors «яркие цвета» and detailed art work. These wooden spoons are truly works of art.